A company called Grayson Wealth Management is cold calling people who have been scammed into buying carbon credits. Grayson Wealth Management’s telemarketers offer them a way of getting rid of their carbon credits. It’s a scam, of course. The scam is a variation on the usual recovery room scam, where companies ask for an advance fee to sell carbon credits. Firstly we are representing a company that will shortly be floating on the US stock exchange. As a forestry management and logging company it is imperative that they show their corporation to be socially responsible and environmentally friendly in order appeal to potential institutional investors. Consequently they have instructed to us to facilitate the purchase of circa $25m USD worth of Carbon Credits. Being a Chinese corporation they are only interested in purchasing Carbon Credits produced within China. Furthermore they wish to obtain carbon credits that have been derived through the successful reduction of HFC-23 (trifluoromethane) emissions into the atmosphere. Only several such projects in China have ever produced Carbon Credits that meet our client’s requirements, therefore our client is keen to acquire and retire Carbon Credits, such as yours that have been derived from the Ying Peng project. To this end we are authorized to present to you an offer of $16.50 per Credit you hold. This price is at a significant premium to the current market value. If your alarm bells aren’t ringing by now, they should be. The first problem is that Grayson Wealth Management is doing what no legitimate investment company will do: cold calling. The only sensible thing to do is to put the phone down. A couple of minutes thought reveals the sales pitch to be full of holes. HFC-23 are among the cheapest carbon credits available. The fact that yours are now several years old only makes them even less valuable. HFC-23 carbon credits sold by a boiler room to retail investors are even more controversial. So why would any company want to pay around US$15 for near-worthless, extremely controversial carbon credits? Why would a forestry company (particularly one that claims to have hundreds of thousands of hectares of tree plantations in China, Brazil, Uganda, Mozambique, and Tanzania) want to buy carbon credits from anything other than forestry projects? And why on earth would a company that decides nevertheless that it wants to spend US$25 million on near-worthless, extremely controversial carbon credits, set itself a deadline of the end of May 2015? This is an equity and not a cash offer. To this end we are authorized to present to you an offer of $16.50 per Credit you hold. This price is at a significant premium to the current market value. This is an equity offer and not a cash offer. The parameters of the offering are as follows: For each Ying Peng Carbon Credit you hold you shall receive 5 shares in Carpathian Forestry Ltd. The current share price of Carpathian Forestry Ltd is $3.30; consequently this offer is representative of the equivalent to $16.50 per Carbon Credit. In order to partake in this offer you simply need to sign, date and return the attached “Carbon Credit Sale & Purchase Agreement”. In addition as a new client we require a copy of your passport, for proof of identification and a copy of a recent utility bill as proof of address. This is followed by promises of exit strategies for the totally worthless shares that Grayson Wealth Management is trying to convince you to swap for your near-worthless carbon credits. The shares are totally worthless because Carpathian Forestry Ltd is not a genuine forestry company. The website was registered (anonymously, of course) a little over two weeks ago on 11 May 2015. 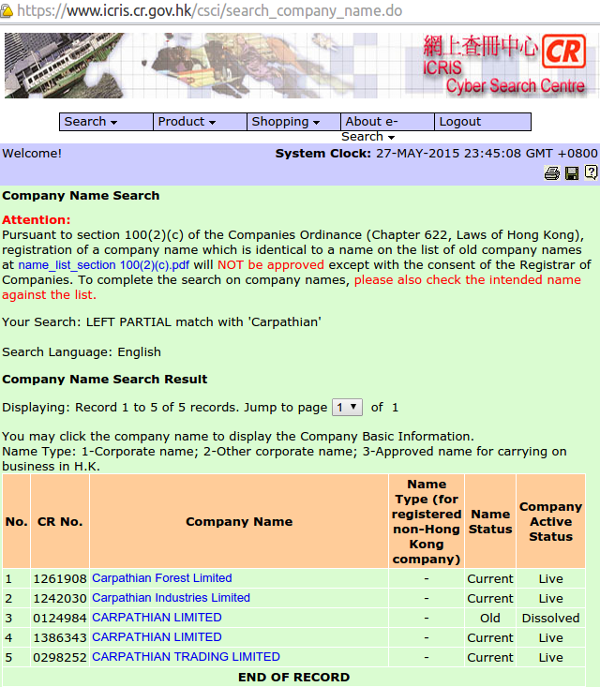 A search on google for “Carpathian Forestry Ltd.” reveals nothing about a Hong Kong-based forestry company, but there is a Norwegian black metal band called Carpathian Forest. The forest in Romania’s Carpathian Mountains is part of one of the most extensive and beautiful forests in Central Europe. The forest is under threat from logging, including illegal logging. The Environmental Investigation Agency recently exposed the role of an Austrian company called Schweighofer in the destruction. This was all reported by Spiegel Online, just a few days before Carpathian Forestry’s website was registered. There are two companies listed on OpenCorporates with the words Carpathian Forest in their names: one in Brazil and one in Romania. The plantations that Carpathian Forestry claims to operate in Mozambique, Tanzania, and Uganda actually belong to a Norwegian company called Green Resources. By now, we’ve gone far enough down the Carpathian Forestry rabbit hole to know without a shadow of doubt that this is part of a scam. So what about Grayson Wealth Management? Is it possible that this company has been duped by a clever scam that started in Hong Kong? On its website Grayson Wealth Management claims to have been “Providing Truly Independent Solutions Since 1987”. I couldn’t find when (or where) the company was registered (a search on OpenCorporates revealed nothing). There is no information on Grayson Wealth Management’s website about who runs the company. Grayson Wealth Management’s website was registered about two weeks ago, just three days after Carpathian Forestry’s website was registered. Both companies use WhoisGuard Inc to mask who registered their websites. Grayson Wealth Management shares its address (2nd Floor, Berkeley Square House, Berkeley Square, London W1J 6BD) with 856 other companies. Regus offers serviced offices, day offices, and virtual offices at this address. And Grayson Wealth Management is not registered with the Financial Conduct Authority. Try checking out Joseph Upchurch with a Moringa scam and Brendon Phillips carbon credit scams for both of these.